Gossamer Gear Gorilla, Red Eagle Meadows. M photo. I have a large pile of packs in the closet right now. The taint of this excess is blunted somewhat by the fact that M and I can wear almost identically sized packs, but the redundancy still gets under my skin. However, given the huge steps in knowledge I took in the last year, I’m prepared to forgive myself. 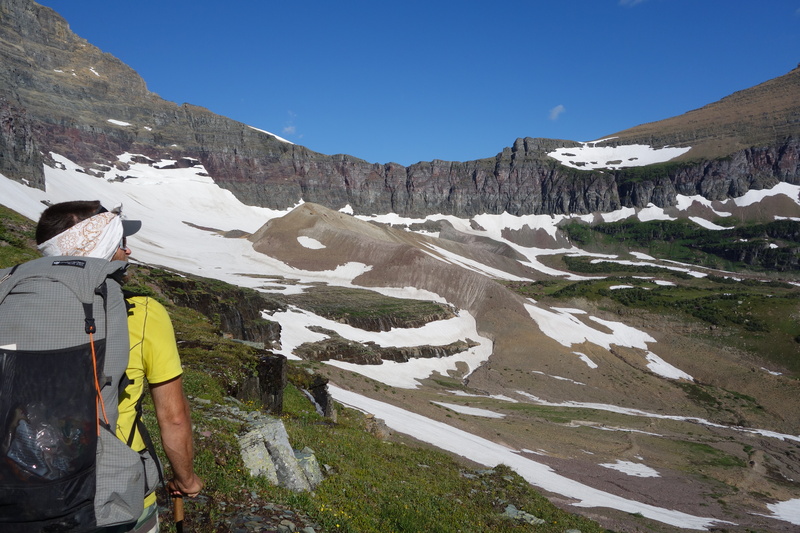 Things got kickstarted when I saw the Gossamer Gear Trail Ambassador application and thought, why the hell not? On the surface their packs didn’t hold too much appeal, but I thought that a company with such an illustrious and well respected history was probably deserving of less cynicism. This was correct. There’s plenty I don’t like about the Gorilla, and the pack shown above took quite a beating back in October, but it also provided un-noticed service on a bunch of heavily loaded trips. I’m thinking of the trip above, where I had six liters of water and most of our food at the start of the second day, or the Yellowstone trip where I had a solid week of food on board. Or even the Tobacco Root trip where I hauled four days of food and a ~27 pound bike up and down mildly technical snow fields. 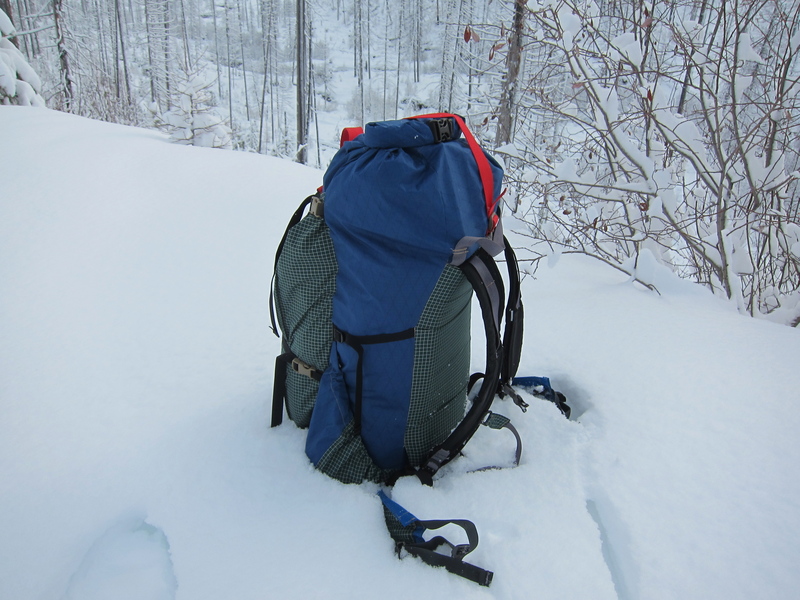 The Gorilla showed me a new benchmark for load carrying with a 1.5 pound pack, and gave me lots of ideas for how minimal materials can be made to do a lot of work. The last two packs I’ve built (see below) are breathtakingly better than anything I’ve made previously, and the Gorilla was hugely influential in their design. The next big step in my thinking came courtesy of Paradox Packs. 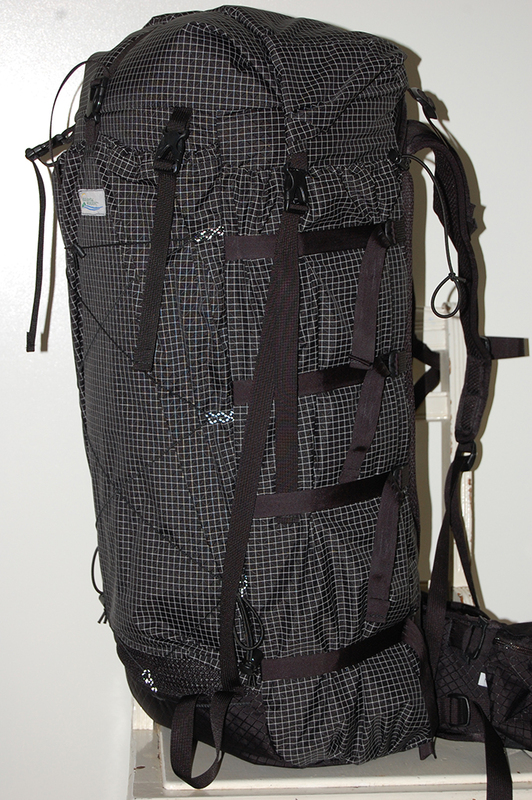 My review of the Evolution frame and 4800 bag was just published yesterday. It was the most complex such project I’ve yet tackled, and the most satisfying, because of the depth of research I had to do into big load hauling backpacks, as subject I only started to put thought into this year. I had run several, rather ineffectual experiments in building load hauler, beginning early in 2013, learning just enough to realize why my designs weren’t working, but not enough to see a solution to the problems. The Paradox frame showed me answers to almost everything in one broad gesture, and the performance of the pack itself surpassed my expectations considerably. I’m still processing the lessons, and need more field time before I formulate meaningful conclusions. As you can imagine, I’m looking forward to it. There’s little as fun as being back on the sharp end of the learning curve. Dave, what do you think about Zpacks Arc Blast backpacks? I’ve not seen one in person, so beware. The design has promise. The air gap “feature” seems gimcky. Going through so much trouble to limit the recommendation to 30 pounds seem self-defeating. 1.What do you think now about sweat mitigation and ventilation? What type of fabric should ideally be on the back and on the inside of the shoulder straps and belt? 3d mesh often is used there. Does it works? In “How pack works” you have showed that Jam’s harness didn’t gain much weight and dried quickly, but 3d mesh sometimes gains snow and even ice. What do you think is the best construction for back and harness (considering other demands like high friction too)? 2.Do you think now that we need an alu stay in small packs like your tamarisk and 610? Folded foam like in B&W or stock foam pad like in Jam is not enough? 3.For bigger packs do you still like frame system like in this pack? How does this pack compares to HMG Porter? Why do you think removeable back pad is so important? For preventing turning into sausage? Why necessarily removable? 5.What do you think about freedom of movement with a pack, and about AARN packs construction in this regard? (There is “Aarn Design Catalogue 2013.pdf” available in google search results, where all the claims are presented). Beg a pardon for so many questions and for my English. I really like your packs. 1: 3D mesh is good. It’s sticky and can help things feel a bit less swampy. Nylon fabric also works. I still like the Osprey system of mesh on both sides and skeletonized foam in between, but this has limits in terms of load it can take without stretching. 2: The system I’ve been using lately makes it possible to have a stay, or not, with almost no weight penalty in the design. Having the option makes tons of sense. 3: I’m liking the single stay a lot better than dual stays. This pack got cut up and rebuilt for that reason. 4: I don’t have much experience with other packs besides the Paradox. It seems fairly easy to built a frame which is rigid enough here. Less easy to make a good harness. Body type seems to drive this choice, especially insofar as hipbelts are concerned. 5: Have to get back to you on this one, as I’ve not looked into Aarn in detail lately. Generally, I prefer to provide flexibility without so darn many moving parts. More parts = heavy packs. implement some horizontal rigidity, to maintain the shape better. 2.How do you like Elemental Horizons Aquilo? What do you think about its tubular stay (similar to Gorilla)? 3.What about tubular stays in general, why not to use them more broadly (in single or dual stay), if tube has more rigidity than a flat stay? Because it is more fragile, more prone to damage? The single stay seems to give up less load transfer than you’d think, and the flexibility in the separation between stay and straps makes for a more wearable pack. Tubular stays have promise. Certainly more rigidity for the weight. They are harder to bend, and can produce pressure points against your back if the design isn’t up to the task. Dave, what do you think about this kind of Porter modification? If we assume that vertical rigidity and weight of the stays are equal, would it be worse/better/the same? That really depends on if you like load lifters or not. I don’t, and below 40-50 pounds I don’t think they’re necessary if the pack is sized properly (which Philip admitted his was not).